To fence in or fence out…that is the question. At least it was one of the major questions early Wyoming lawmakers grappled with when it came to landowners’ rights. Large cattle operations relied upon open range grazing on government lands to sustain their herds. These savvy businessmen could control much more land than they actually owned by controlling the water and access to it on the semi-arid plains. There was minor bickering among these large outfits, mostly about said water rights, but the major disputes did not erupt until fences began to appear, cutting up the wide open spaces and making it hard for open range cattle to access grazing and water. The construction of fences eventually contributed to the end of the large scale open range cattle industry. The question became was this fence to keep the cattle in or out? 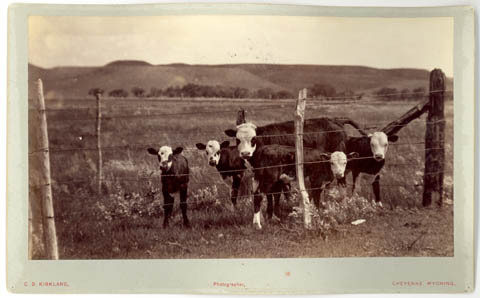 Cattlemen argued that their livelihood relied upon the open range and they were entitled to the use of government lands and thus fencing was detrimental, if not criminal. Settlers, farmers and smaller producers argued that fences helped to protect their lands and herds from the damage done by open range herds (and their handlers). Tempers flared, sides were chosen, and lawyers hired (and some gunmen, too) as the situation escalated. Eventually, it was decided that Wyoming would be a “fence out” state, meaning that if you owned property you were expected to construct and maintain fences that kept whatever it was you did not want on your property out, rather than building fences to keep what you wanted in, or on your property. This decision favored the open range cattle industry who continued to use their money and influence to protect this right. 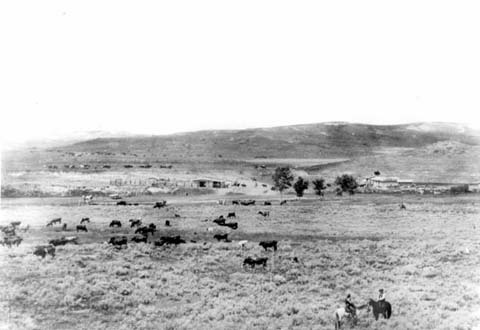 Roundup at Heaton Warm Springs near Douglas, 1887. But his time as governor was not long. Baxter’s opponents almost immediately accusing him of illegally fencing government and he was removed from office December 20th, less than two months later. Secretary of State Elliot S.N. Morgan took over until Thomas Moonlight of Kansas, a vocal opponent of cattlemen in general, was appointed in January 1887. 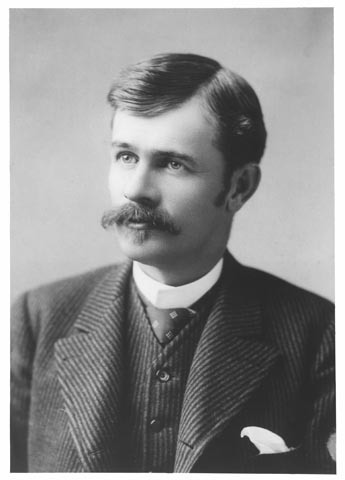 Baxter was later a delegate from Laramie County to the Wyoming Constitutional Convention and made an unsuccessful run for governor in 1890 against Francis E. Warren. In 1936, Edith Alger of Lander contacted John A. Baxter requesting information about his time in Wyoming. Alger was employed by the Works Progress Administration’s Federal Writers Program. This program was designed to provide jobs to the unemployed while collecting the history of their area through several projects, including the Stories of Pioneer Life project. Baxter and Alger exchanged several letters that year, one of which included this defense of his brother’s actions. When Cleveland was president of the US and Wyoming a territory, and the governors were appointed by the president, the people of Wyoming requested he appoint someone who resided in Wyoming instead of sending some on from some eastern state out to Wyoming to be governor; so Cleveland consented, and he tendered the honor to my brother, who, while a Democrat, was not a strict partisan, but he was classed as a businessman. Now, some of the active Democratic politicians, no doubt hoping to be the lucky man, began to complain and told Cleveland that Baxter had fenced in unlawfully government land. He was removed as governor and Moonlight of Kansas was named instead. You may know that the United States gave the Union Pacific Railroad as a subsidiary every other square mile for twenty miles both north and south of the survey of said railroad. The railroad held said land for about twenty years after they had finished their road before offering it for sale. My brother sought advice from the best lawyers in the east, and was assured that he would have the right to fence the same. 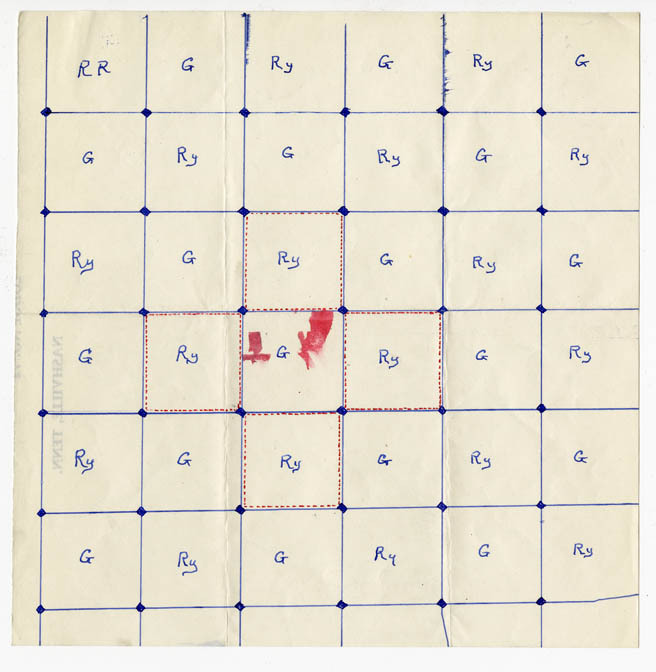 Now this grant of every other section of one mile square made a checkerboard condition, so I herewith hand you a diagram, showing clearly, that it was impossible to fence his land purchased of the railroad, without fencing thereby the government sections. On this map I enclose you will notice the little black spots at the corners of each section represents the cornerstones that marked and defined each section, and to make it clear to your mind I have used red ink marking a dotted line around four sections, and the same necessarily enclosed the one section of government land (where there is a blot of red ink) and that was the cause of their saying he had unlawfully enclosed government land. Now to remove any impression upon the minds of the public that he had unlawfully fenced government land and to remove the implied stigma, my brother forced the question after his removal up to the US Supreme Court, and they decided in my brother’s favor, and that the same was Not Unlawful as every post hole was on his own land, and the wires from post to post were over the land he had purchased and owned. So you see he was removed for a charge which did not exist. In spite of their political trickery and a false accusation, my brother’s name is respected by all that knew him as an honorable upright man. Diagram sent by John Baxter showing how his brother’s fences were constructed. 1. To be precise, Wyoming is a “fence out” state for cattle (and domestic buffalo), but a “fence in” state for sheep. For more information, see “You Fence It, They’ll Stay Out” from the University of Wyoming Cooperative Extension Service. 2. “Letters from John A. Baxter, Concerning his brother, Territorial Governor George W. Baxter” September 6, 1936. WPA Bio File 45, Wyoming State Archives. 3. Governor Baxter had died at his home on Long Island, New York, in 1929. He is buried in the family plot in Knoxville, Tennessee. 4. “Letters from John A. Baxter, Concerning his brother, Territorial Governor George W. Baxter” September 18, 1936. WPA Bio File 45, Wyoming State Archives. Minor formating and spelling changes, but the emphasis is his own.